Endodontic procedures are a common and specialized process that has become routine in the dental community. Having the proper endodontic instrumentation can help expedite and ensure a successful root canal procedure. 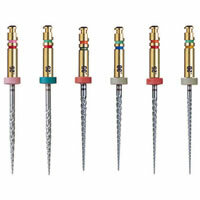 There are instruments for every step of the procedure from endodontic burs and files for canal shaping, to endodontic apical obturation instruments for filling the root canal, and everything in between. Many of these instruments can help make the root canal procedure more comfortable and efficient for both the patient and dentist.